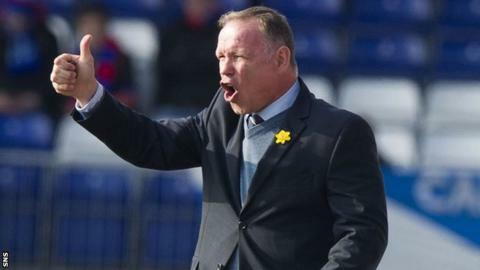 John Hughes has defended himself against those who question his desire to have his Inverness players trying to emulate Barcelona's passing game. "You'll never get close to them - never in a million years," the Caley Thistle manager admitted. "You can live until you're 60 and never get close to them. "But we're not playing against Real Madrid and Malaga, no disrespect to the rest of the teams. "It all balances itself out. But you need that vision to inspire you." Hughes took over after Terry Butcher's departure for the Caley Thistle manager's former club, Hibernian, in December. They have slipped from a high of second place to fifth after a run of nine games during which they have only recorded one victory. But Hughes is determined not to stray from his preferred passing style and took his squad back to school ahead of Friday's Highland derby against Ross County. "You just have to keep believing," he told BBC Scotland. "It is my ideas and my philosophy. I am not going to ask them to train one way and play another. "I took them into a classroom this morning and read the two football bibles - for the moment for me - it's the Barcelona book and Pep Guardiola's book. "Going on the tactics board, taking the tactics board on to the training pitch. "If you've not got a structure or philosophy, the game becomes individuals and if you've got a team of individuals then you'll never win a football match." Despite Tuesday's 2-1 home defeat by Motherwell, Hughes was pleased with his side's performances but stressed they were a "work in progress". "If you look at the European Cup semi-final two seasons ago, Inter Milan against Barcelona, Barcelona total football, a team I would pay money to watch, and yet it's a boot up the park, a flick on and it is in the back of the net and the cup goes back to Italy," he said. "That's similar to what happened to us the other night. Two long balls and it's in the back of the net." "We're controlling the football park and passing it well - a little bit slow, we have to speed it up, that's for sure. "It is going to take time. We just have to show patience. "Terry left with a great bunch of boys with great values and he prides himself on clean sheets and that's where we've let ourselves down. "Just because we play an expansive style of football, doesn't mean we let the other team score goals."